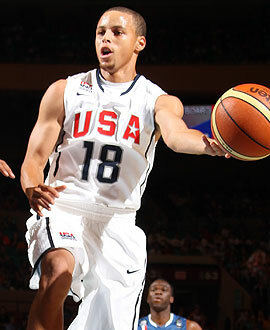 Charlotte native and Golden State Warriors star Stephen Curry was named to the 2010 USA Basketball Men's World Championship Team yesterday, after the roster was cut down to the final 12. The other players on the U.S. team are Chauncey Billups (Denver Nuggets); Tyson Chandler (Dallas Mavericks); Kevin Durant (Oklahoma City Thunder); Rudy Gay (Memphis Grizzlies); Eric Gordon (Los Angeles Clippers); Danny Granger (Indiana Pacers); Andre Iguodala (Philadelphia 76ers); Kevin Love (Minnesota Timberwolves); Lamar Odom (Los Angeles Lakers); Derrick Rose (Chicago Bulls); and Russell Westbrook (Oklahoma City Thunder). The U.S. is one of 24 teams that will compete in the 2010 FIBA World Championship for Men, which runs from August 28 to September 12 in Turkey. The U.S. will play their first game this Saturday against Croatia. For more details, visit www.usabasketball.com.